HTC 10 receives FCC approval? The HTC 10 took a big step toward its eventual U.S. launch. Two models of the manufacturer's next flagship phone, the 2PS6200 and 2PS6500, both were approved by the FCC. 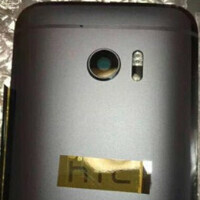 Expectations for the phone have risen sharply thanks to teasers released by HTC. One called the device "the smoothest and fastest Android phone," while another touted both cameras on the HTC 10 as being "world first, world class, front and back." The HTC 10 is expected to feature a 5.1-inch display with a resolution of 1440 x 2560. The Snapdragon 820 chipset is under the hood with a quad-core CPU and the Adreno 530 GPU. 4GB of RAM is on board along with 32GB of native storage. A 12.3MP camera adorns the back of the unit, with a 5MP front-facing camera handling selfies and video chats. Android 6.0.1 is pre-installed. The HTC 10 raised some eyebrows by reportedly scoring 156,091 on AnTuTu. That topped some powerful handsets like the Samsung Galaxy S7 edge, the Xiaomi Mi 5 and the Apple iPhone 6s. The HTC 10 should be unveiled on April 12th in New York, Taipei and London. For all of you HTC fans out there, this just might be the "hero" phone that you've been waiting for. HTC 10 gets FCC approval? We won't pay $900 for AnTuTu scores. The real question is.... When was the last time a phone wasn't approved by the FCC? Thanks Bro. I keep wondering why the question mark? "HTC 10 receives FCC approval?" I suspect we never hear of the devices that get rejected. There's no way the HTC 10 will run so much faster than the S7 when they both use the same cpu/gpu combination. Some attributes why it might run a little faster are the following, but these attributes won't fully explain why it would run so much faster. 1. Cpu/gpu is clocked faster. 2. Lower screen resolution. 3. Sense is leaner than touchwiz. I'm hoping that HTC 10 will a different Gpu than the s7. Also have to consider RAM management. The G5 runs faster than the S7. Only 32 GB? I thought it was shipping with up to 128 .... now I'm confused.